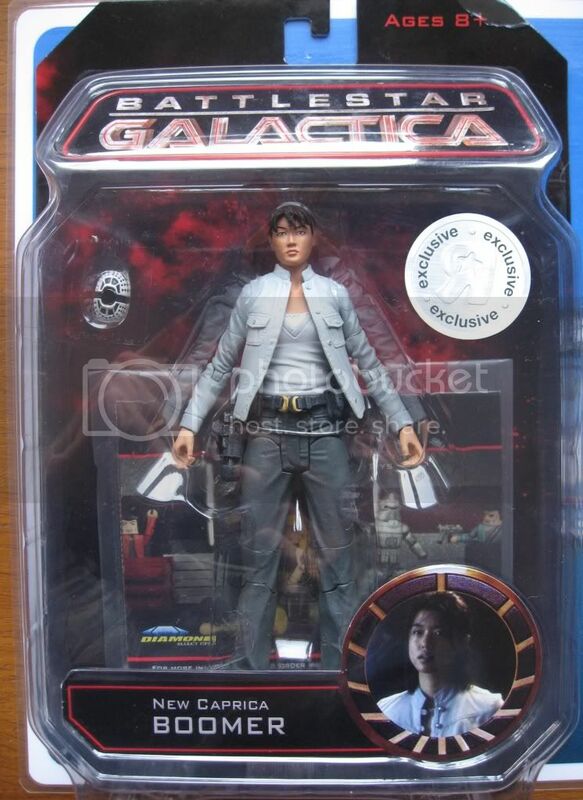 It's one of the best "Grace Park" face I've seen on an action figure. And it's the first really available yet. (not counting the often seen-but-never-released-prototypes) There must be a variability, but mine is very well "drawn". Boomer has *never* been seen with a weapon after KLG2. (I used this in my fic Another Perfect Day) That's not very fair. That's even scandalous *. And why has she the "Cylon Device"? Look at the text: After being reborn and discovering her true Cylon nature, the Number Eight model known as Boomer sided against her former friends and helped the Cylons maintain their occupation of New Caprica. Simplistic, and and not much fair either. No Caprica-Boomer quixotic "Live in Peace" project? The pict' on the right bottom comes from Eye Of Jupiter, btw. Boomer never wore this outfit on New-Caprica. (I'll check again, but I'm quite sure) She was seen in it in Rapture, too. EOJ, 15th mn, just before "That's Boomer"
Anyway, that's great to have a Boomie action figure now! Bear in mind, my friend, that these figures were cobbled together because they had nothing ready when the first wave sold out at lightspeed; Toys R' Us wasn't ready for the response and neither was Diamond Select. This current wave is a flung-together assortment of a rejected Boomer figure (remember the one with the loose hair and the terrible face, a while back, called New Caprica Boomer, that was supposed to be a 2 pack with D'anna? 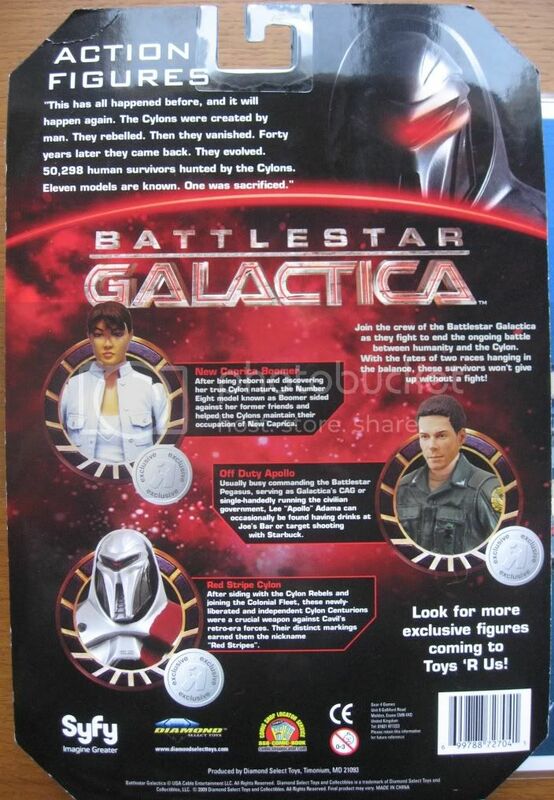 ), a Lee Adama head on the Chief's body, and an existing Cylon painted with a red stripe (which admittedly looks pretty cool.) She's wearing uniform pants in both sculpts, old and new, so I assume a uniform Sharon had been planned for quite a while, unless they are using the Cain lower body sculpt, which is totally possible. They were lucky that the outfits are quite similar - the pockets are wrong, though. Doing such a thing from scratch must be expensive? 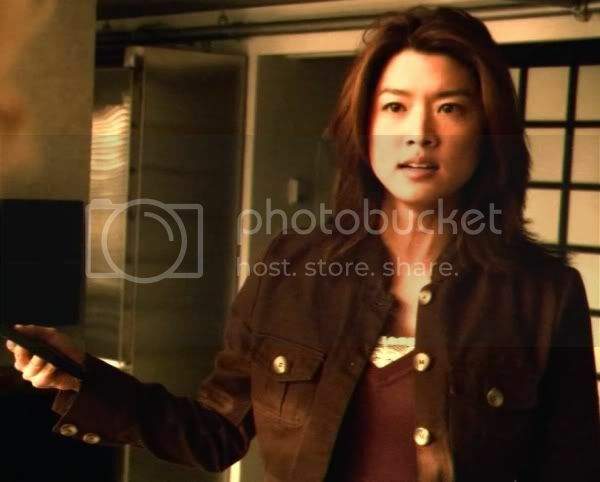 edit: oops, I checked ( future Boomer & Athena figures ), you're right, that was supposed to be "New Caprica Sharon", but with a Downloaded (100% accurate: brown coat, dark red shirt/whatever clothe piece under it) outfit. Losers! 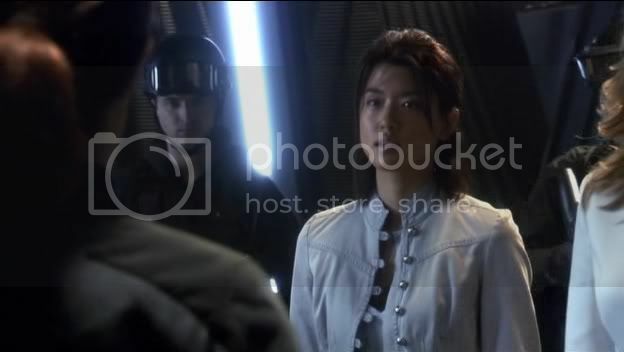 As to the accessories, I think they just threw together what they had; I think (don't quote me, not totally sure) that the Sixes came with the Cylon Device, and that belt and holster is standard issue. I am more entranced by the shiny silver shoes than anything else. Why EVER did you doubt that I was right? Well, it looks good no matter it's history. 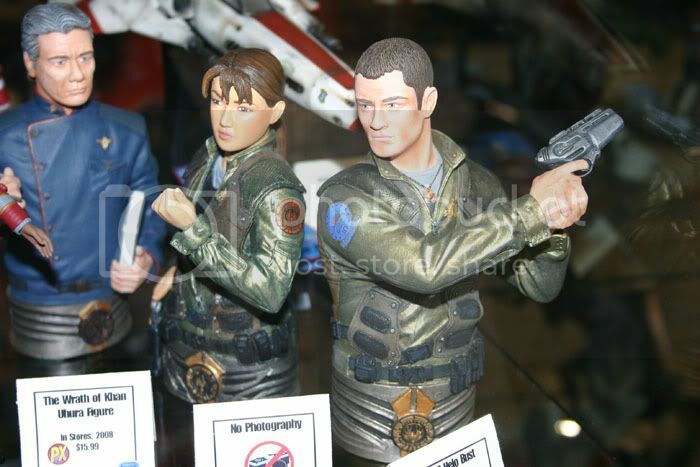 Did they ever release the Sharon bust...or any of them for that matter? Best of anyone's knowing, the Boomer and Helo figures are still "pre-order" and haven't yet been released. They aren't listed on Diamond Select's website anymore, either. That does appear to be the sculpt used on the current Boomer figure, though- I think they took the head off the prototype bust and used that one. Bigbadtoystore still has the Helo bust for pre-order (and mentions the "upcoming Boomer bust"); but they just moved the date for the past years, so I doubt this will ever be released. Yes, I thought about it too, and a close check shows the similarity. Yeah, that seems excessive. As far as being with the Cylons, one of the points I took from Downloaded was that Boomer didn't have any choice. She was stuck with them. She clearly seemed to retain some emotional affinity for humans at the end of that episode, and was the major voice decrying the mistreatment of humans on New Caprica. And it's not like their occupation would have faltered without her; she wasn't even associated with security. The whole thing never made sense, but I still suspect we'll get a dumb overwrite in "The Plan." Pierre, was that you on the DST question-and-answer complaining about the Boomer figure's tiny head? What is DST? Day Saving Time ??? I'd bet for Diamond Select Toys but you know I'm a bit allergic to acronyms .